across generations. The purposes of this study are: (1) to measure and explain changes in the gender-specific short and medium term returns to education in different sectors (private and public, formal and informal, tradable and non-tradable), and (2) to examine the long-run effects of education from generation to generation and, in the process, to measure the extent to which, how and why intergenerational mobility has changed over the last twenty years. 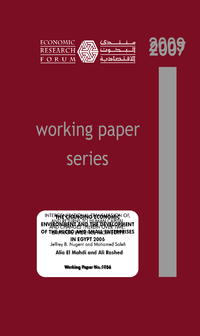 In estimating both the determinants of schooling (including its intergenerational transmission) and the returns to schooling and changes therein over time, the study applies a number of estimation techniques to data taken from family members of different generations from the 1988, 1998 and 2006 waves of the Egyptian Labor Market Survey (ELMS).